My process can be used for not only fonts, but any shape or outline. The settings can be changed for your specific needs.. so experiment!! 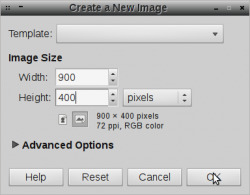 First off you need to open Gimp and Create New using these settings..
Keep this layer named background and fill it with black. your Alignment Tool and merge this layer down to the black background. Should look similar to mine This will be our Bump Map. 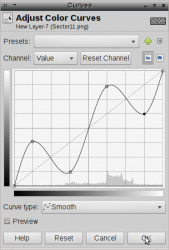 For the Final part of step 2 we will go to Filters/Blur/Gaussian Blur and do 7 for both settings. Should have a slight blur to your Bump Map now. 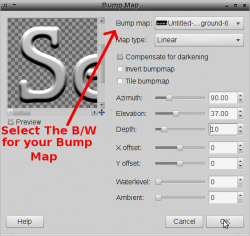 Now select your Fuzzy Select Tool (or magic wand) and we need to select our text by clicking the black area outside and the inside black areas of our Bump Map layer. With the selection still active create a new transparent layer. Now select our Blend Tool and change our foreground and background colors to these. With our outline selection still active go to Select/invert click to invert our selection. Go to Select/none and click it to remove the outline selection. Now lets use our Bump Map. Still on our new layer with the Gradient gray text go to Filters/Map/Bump Map and select it. Click ok and your gray text should look like this. With some nice depth added to our text. Lets turn off the visability our Original B/W Background layer by clicking the eye out to the side of the layer.. because we are done with it.. This step is one of the coolest in my opinion. You get to see some of the power that Gimp has!! Now lets duplicate our chrome text layer and turn off the visibility of the copy as we will work with it later. Go to Layer/Transparency/Alpha to Selection which will select our text.. Now go to Select/Shrink and use 5 for the selection. Now for the inside of our text. Now select the copy from step 6. Go to Layer/Transparency/Alpha to Selection and then Select/Shrink and do a selection of 7 this time around. Now we need to Select/Invert then Select/Feather and chose 7,000 for this one. Now lets Merge the 2 layers together and you should have this.. This is our Final step.. This is how we get our "transparent" Glass effect. Go to Layer/Transparency/Color to Alpha. Lets select a gray that is the middle of the gradient that we used earlier so we will select "d4d4d4" and click ok.
Low and Behold!! We now have a very cool Glass looking text!! Have fun with this and experiment!! You can use different colors for the Gradient.. just try different settings. NICE! Thank you for this falldown. Very nice falldown... I am going to be this same forum for a couple of schools and a golf course, so this will come in handy. Or I will just say Hey falldown, or jst_joe... HELP! Thanks for posting this, it should get a lot of traction! Just yell when you need some help with anything VastOne. Great how to falldown, you know I have used it. I changed the links in my other posts to point here. I remember the first time I tried this I got so frustrated. I changed the font size and it really messed things up and gave up. Actually I think maybe falldown might have left the transparent Sector11 .png laying around someplace and I just "jedi'ed" it into place. I really should try again, I see other's have made some really sharp stuff! Like jst_joe's Planet VSIDO! for one. <<-- but not limited to that! Get ready for questions falldown. Now we need to take our Fuzzy Select Tool (or magic wand) and we need to select our text by clicking the black area outside and the inside black areas of our Bump Map layer. With the selection still active we will create a new transparent layer. Now we need to select our Blend Tool and change our foreground and background colors to these. With our outline selection still active we need to go to Select/invert click to invert our selection. I still have a black background when I do this right? Even though I created a transparent layer above. grey text with black background? When you start #4 I see "Se" with a transparent background. Then an image with a black background, and then another with a transparent background again. Obviously there is something that does not compute between my ears. I will help you with this in a bit S11.. out the door to get the lil ones. I'll have the coffee ready when you get back. I did some editing in first post S11. Lets see if that clears up the when issue. Enjoy your coffee - wife and I are out of here in minutes. I'll be back tomorrow. Thank you! "Lets turn off the visability our Original B/W Background layer by clicking the eye out to the side of the layer.. because we are done with it.."
"by clicking the eye out to the side of the layer"